Never heard of/seen a JD 10 HD small square baler. Posted: Sun Mar 03, 2019 6:24 pm Post subject: Never heard of/seen a JD 10 HD small square baler. I have never seen or heard of a JD 10HD small square baler. I do mean small. The bale looks to be a foot tall and 18 inch wide. They would be great for the fall craft stores and such. Machinery Pete has a video about one. 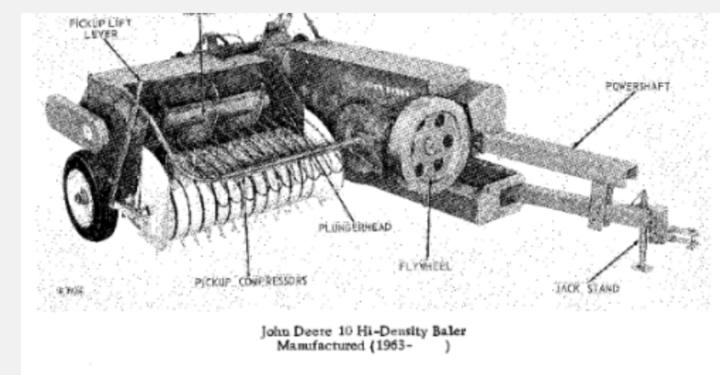 Posted: Sun Mar 03, 2019 7:16 pm Post subject: Re: Never heard of/seen a JD 10 HD small square baler. Several years ago at the show in Fairview, OK, there was a guy there baling some wheat straw with a JD model 10. They are a wire tie high density baler, however, he didn't have enough tension on and the bales were very light and not tight at all. I even brought one home just for a conversation piece, but finally got tired of messing with it and used it. Posted: Sun Mar 03, 2019 7:59 pm Post subject: Re: Never heard of/seen a JD 10 HD small square baler. I have two different brochures for the 10 baler. They make a 10x15 bale and a plunger speed of 95 strokes. Posted: Sun Mar 03, 2019 8:19 pm Post subject: Re: Never heard of/seen a JD 10 HD small square baler. Posted: Mon Mar 04, 2019 3:34 am Post subject: Re: Never heard of/seen a JD 10 HD small square baler. 1963 was the beginning manufacture date of the model 10. Posted: Mon Mar 04, 2019 3:49 am Post subject: Re: Never heard of/seen a JD 10 HD small square baler. The #10 was an attempt to help custom growers get more tonnage on a truck by making the bales more dense. It never caught on. Posted: Mon Mar 04, 2019 9:28 am Post subject: Re: Never heard of/seen a JD 10 HD small square baler. We had one at our local JD dealership where my dad worked, years ago. As mentioned made small compact bales. I only remember them trying it on a few fields one year. Back then most bales were handled by hand anyway, but now would never work on a bale wagon. Heard of a guy overloading his hay trailer because he loaded it to normal size but had a lot more weight. That story like many could have been imagined by someone. Posted: Mon Mar 04, 2019 10:59 am Post subject: Re: Never heard of/seen a JD 10 HD small square baler. Heck, I thought you might be talking about the JD bailer we called the side shooter. It was the smallest bailer ever made that I know of. Hired a guy when I first moved to Mos to come bale for me, and he came with that. Did a good job. Posted: Tue Mar 05, 2019 9:50 am Post subject: Re: Never heard of/seen a JD 10 HD small square baler. I wouldnt mind seeing a thrower on the end of that baler just to see how much air it could get on one of those.